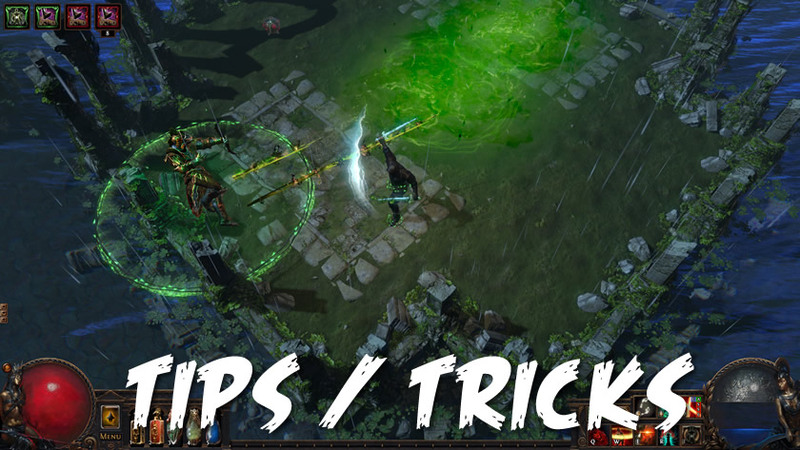 40 Useful Tips for Path Of Exile "War For The Atlas"
With War For The Atlas around the corner, there are some nice little tidbits that you need to know about the game before you dive into the action. Here are 40 tips that will help you out. 1. CTRL + clicking on waypoint/next area = screen to reset the instance. Handy for repeatedly farming zones. 2. CTRL + ALT + clicking links an item in chat. 3. Trade Chat is 100% awful. Use "poe.trade" or "www.pathofexile.com/trade". 4. Vendoring a Skill Gem + an Orb of Scouring results in the Skill Gems level decreasing BY 1. 5. Vendoring a Skill Gem + an Orb of Regret results in the Skill Gems level decreasing TO 1. 6. Vendoring a Scroll of Wisdom + an Orb of Scouring results in a Book of Regression, decreasing your characters level BY 1. 7. Use Cartographer's Chisels on common maps only. That way it only costs 4 to get 20%, not 10-20 of them. 8. Holding ALT after mousing over an item shows its level. 9. The STAUNCHING affix on flasks (immune to/removes Bleed) becomes available and itemlevel 8. I aim to have a Staunching health flask by Act 4. 10. /global 820 for all your challenge and Master levelling needs. Remember to share not just leech! 11. You can level other skill gems by placing them in your alternate weapon/s slot. Press "X" while looking at your inventory. 12. Dual Wielding two weapons of any type gives the following stats: 10% more attack speed, 15% additional block chance and 20% more physical damage. It is seen as the damage output between a weapon+shield & a two hander. 13. Change your Left Click binding to "Move Only". 14. /remaining shows the amount of monsters left in the zone. 15. /hideout TPs you to your hideout if you have one. 16. Vendoring a Transmutation Orb results in 4 Wisdom Scrolls. 17. You can ID and use currencies on Strongboxes. 18. /abandon_daily purposely fails your Master mission. Or talking to another master and clicking Abandon. 19. /autoreply [message here] automatically replies with the chosen message to anyone who talks to you. Handy if you're momentarily busy. 20. /afk [message here] does the same as above, while letting the person know you're AFK. 21. Mapping consistently, while not the fastest, is a very reliable way of gaining currency. Alch a map and run it, as soon as you have finished, open another and vendor your things while waiting for the portals. 22. Ice Nova from Strongboxes is nothing to scoff at. It will get you killed if underestimated. 23. Getting a Loot Filter increases the games/players QOL by a ton. Neversink's is an obvious first choice. 24. You can control the spread of Projectiles by clicking closer to your character or further away. 25. Divine Orbs only reroll inside the stats current tier/range. 26. The Chaos Recipe is really only worth doing in the beginning of a League when Exalted Orbs are cheap. This is an opinion not a fact though, so play how you want! 27. SHIFT + clicking a stack of items gives you the option to split the stack. 28. Holding SHIFT after right clicking currency allows you to use said currency multiple times without having to right click again. 29. Cast When Damage Taken when linked to multiple castable spells or attacks, casts in a clockwise order from the top left. 30. Escape > Input > Bind "Attack in place" to Numpad 6 > Press Numlock > Hold down Numpad 6 and press Numlock again, let go of both. You can now attack in place without holding any keys. VERY useful for movement skills. 31. Escape > UI > Change Landscape Transparency to 0 / far left & Map Transparency to 100 / far right. 32. The - and + keys on the Numpad reduce or increase the size of the Map. 33. When you use an Orb of Fusing or a Jeweller's Orb on an item, each 1% quality improves the result by 1%. This makes the Fusing process 20% easier on 20% quality items, for example. 34. Adding sacrificial and mortal fragments to your map when you open it increases the map quantity. Sac = %5 each for a possible 15% and Mortal = 10% each for a possible 30%. 35. Running a Map unidentified adds an additional 30% quantity bonus. Does not apply to Unique maps. 36. CTRL + click to both buy things and allocate passives quickly. 37. SHIFT + ENTER to enter global chat. 39. CTRL + ENTER to reply to the last whisper recieved. 40. F1 brings up a small overlay of frame rate and latency. Path Of Exile "War For The Atlas" launches on December 8 (Pacific Time) on PC and shortly after on Xbox One. Get ready because the Atlas is coming.